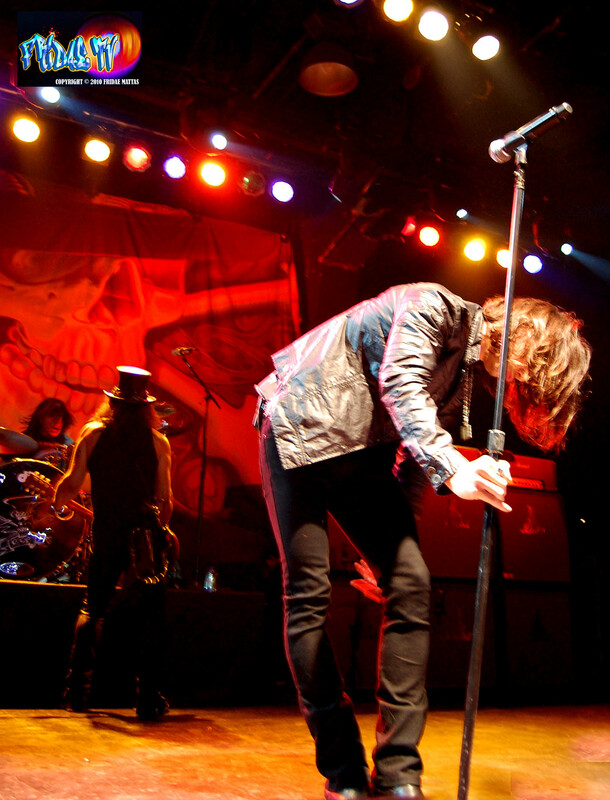 SLASH LIVE IN TORONTO REVIEW! 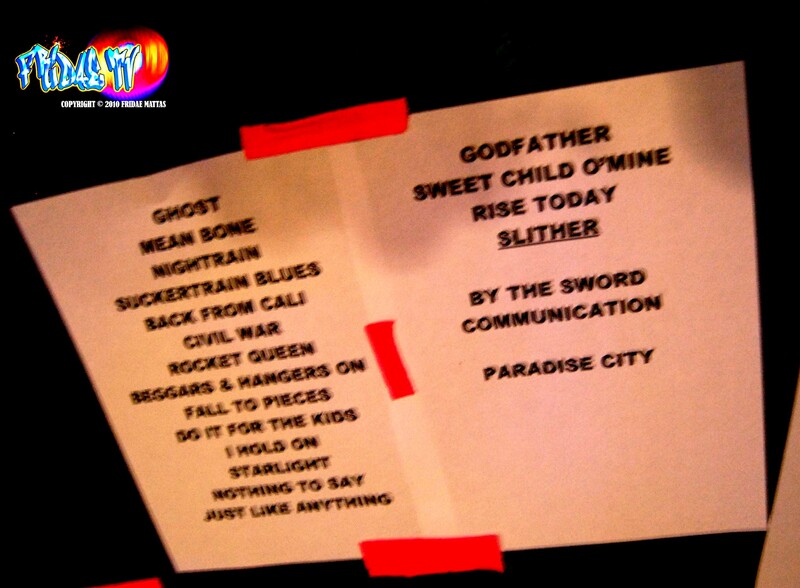 September 10th was the day, Kool Haus the venue and Slash…The Artist. An Electric Guitar or Guns N Roses comes to mind when one thinks or speaks of Slash, If there wasn’t a guitar somewhere in your thoughts, you are lost. I have never seen Slash or Guns ‘N Roses live, yet this wasn’t my first encounter with Slash, I captured some of his interview at Canadian Music Week back in March. It was madness; the hardest filming ever, you can watch the CMW jibbers here and here. For those that don’t know who Slash is, where have you been? Chilling in the caves with Osama? 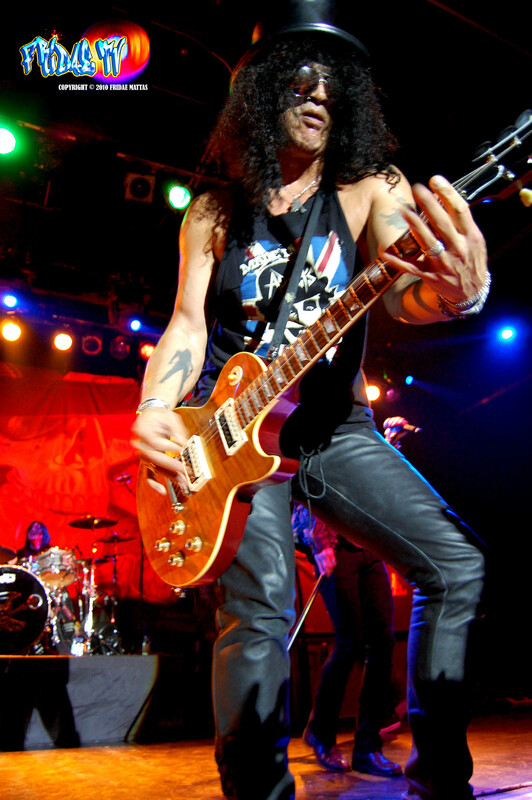 Slash is the modern day Jimmy Hendrix with a razor edge, the Godfather of Guitar! 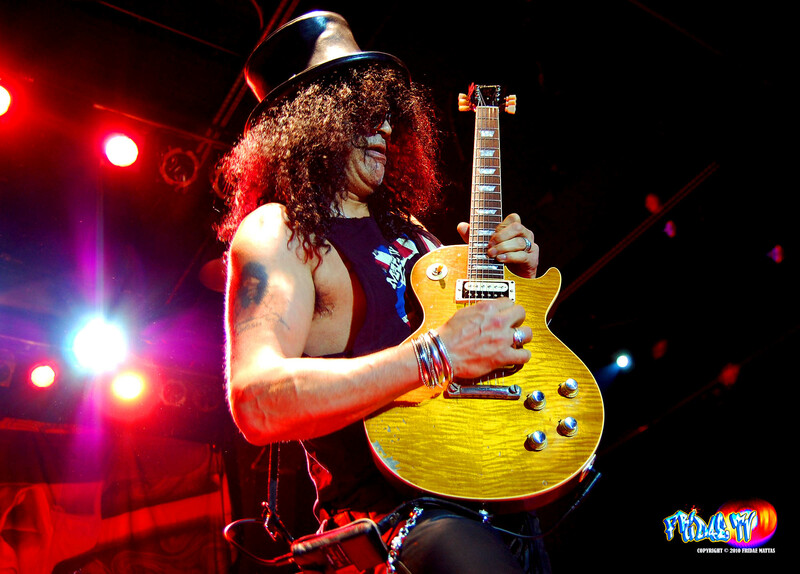 Slash was born Saul Hudson his claim to fame was being the Lead Guitarist of popular rock band “Guns ‘N Roses”, he also had ‘Slash’s Snakepit”, is co-founder of the band “Velvet Revolver” and currently “Slash” the solo artist. In my lifetime there will never be anything like hearing ‘Sweet Child O’ Mine’ played by the original Axemaster of the tune! Of course singer Myles Kennedy (Alter Bridge) is not Axl, not even close. Kennedy didn’t even bother with some of the high notes he just sang it in his range attempting to do the runs near the end of the track, they didn’t come out too bad. ‘Sweet Child O’ Mine’ is a hard song to sing but if you attempt it, you need to deliver. Kennedy as the singer of Slash’s touring band has the stage presence but the vocals are lacking, he needs to work on them, a lot. Musically everything was tight, everyone played off each other smoothly and although vocals weren’t up to par, Kennedy’s charisma works to his benefit. 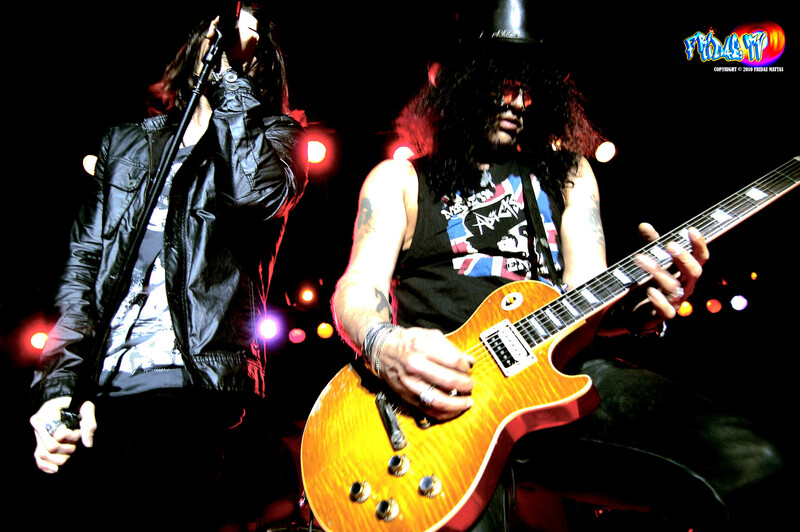 There is one song on Slash’s record that Myles sings on, it’s called “Starlight” and they played it in the set, vocally the better one of the night. Must say for someone whose singing another persons songs he knows how to feel the music and perform for the audience as every front person should. 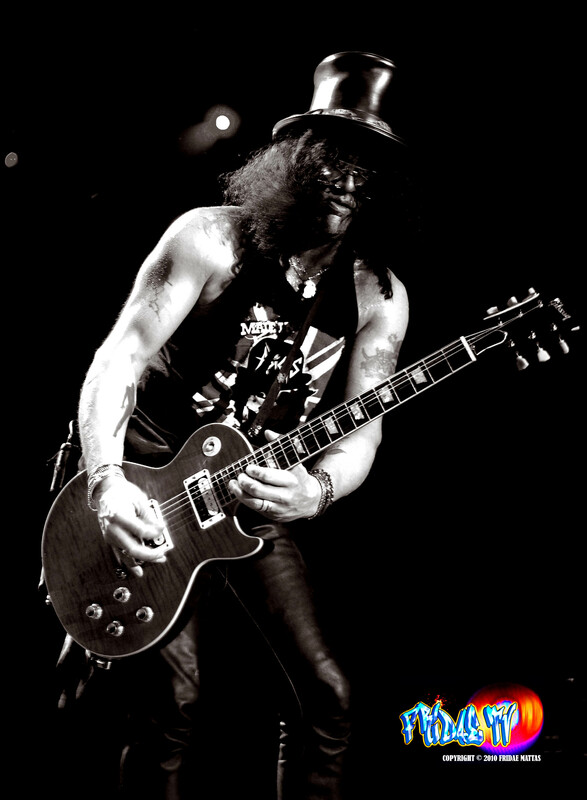 They started the twenty one track set with ‘Ghost’, immediately there was so much energy, Slash was flying all over the place with his Axe in hand. It was amazing to watch and listen as his hands magically floated along the guitar. He definitely goes into his own world when he plays; most larries have their specific facial expressions when rocking out as does Slash. You could tell he loved every minute but of course he did because Slash is a real musician! 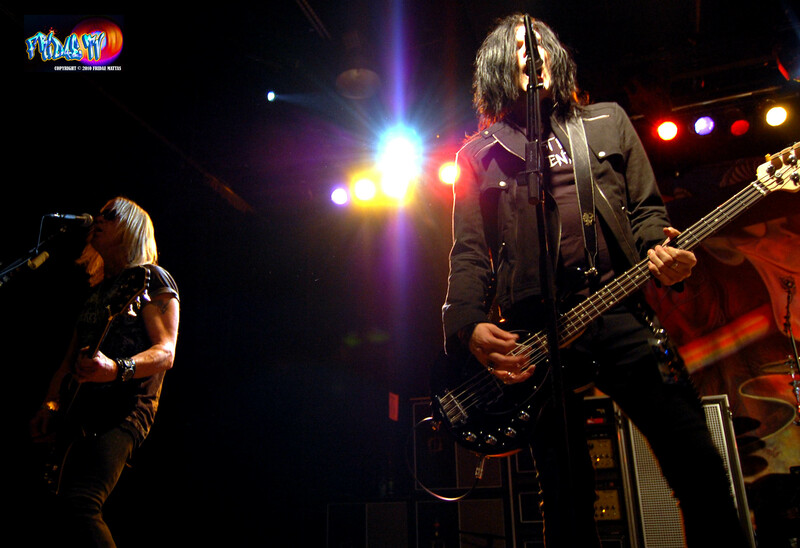 If there isn’t any emotion visible other than nerves…Get off the stage, you don’t belong. The backdrop was Slash’s trademark symbol a skull in a top hat which he has a tattoo of on his left bicep, you can see the tattoo in a few of my shots. This is my favorite stage of the year! Perfect level, completely forgot about the Kool Haus stage because I don’t cover shows at this venue often. It’s too far from the core where everything is. Slash’s fingers were hard to get in focus because they moved so fast, the music was a mix of his solo tunes and old band tracks. After forty five minutes or so Kennedy’s voice was really getting to me, my ears were not liking too much of those flat lambish squeals. Kerns and Schneck did a fantastic job rounding out the vocals giving Kennedy much needed harmony. The show was great but honestly I would have much rather listen to Slash and band play the songs without the vocals. The closing track was ‘Paradise City’ which I missed because I had to leave, my ears were hurting and my head was starting to pulsate from the overdose of larry’s voice. Majority of the crowd stayed to see the sold out show, I’m surprised it sold out because across town there was another big show at the Molson Canadian Amphitheater where ‘Kiss’ was playing. Go see Slash live if you can! I definitely made the right choice, very happy with the outcome! Huge thanks to the amazing people at Live Nation! ©2010 FRIDAE MATTAS for FRIDAE TV. All Rights Reserved.